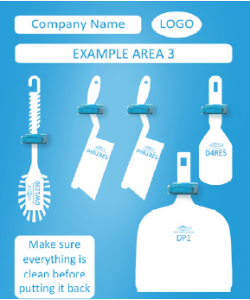 Offering a bespoke Shadow Board service, Fletcher European can help enable your business to hygienically organise and store its cleaning equipment. Perfect for use within food service and processing situations these shadow boards are intended to allow for segregation of the workplace cleaning equipment. They also allow you to monitor the quality and whereabouts of each product and to help avoid cross contamination within hygiene sensitive environments. Our specialist team are at hand to assist you with the creation of a shadow board that suits your needs exactly. Give us a call today to discuss your requirements.